Counselor Requirements: Those applying to be counselors must have already completed one year of college (or the equivalent) prior to the start of their position at Amplify. Those who have not yet completed this may apply for the Teen Leadership/Counselor in Training Program. Group Directors are veteran counselors. They have previous experience working at Amplify or Girls Rock SB and are responsible for supervising our counselors and directing their respective division. They provide guidance and support to counselors, help manage groups, organize activities, assist in Progressive Programming strategy and act as the liaison for parent communications. Instrument Coach: Instrument Coaches need to have previous experience teaching, ideally with youth. It is ideal if you have written a class curriculum before, however we can provide you with that if you have not. Instrument teachers should feel comfortable with a class size of between 4-8 campers. Instrument Coaches hold the same responsibilities as the general counselors, with the addition of teaching a specific skill during the day. Those who wish to be counselors and have a passion for one of our activities offered are well-suited to be activity counselors. Band Coach: Band Coaches need to have previous experience being in a band before and ideally writing music. Band coaches should feel comfortable with a band size of 3-6 campers. No experience teaching music needed. Band Coaches hold the same responsibilities as the general counselors, with the addition of teaching a specific skill during the day. Those who wish to be counselors and have a passion for one of our activities offered are well-suited to be activity counselors. Workshop Leader: Workshop Leaders should feel comfortable working in larger groups ( between 10-20 campers) . All workshops need to be interactive. You will have at least 3-4 staff helping supervise the workshop at all times. Some workshops we have offered in the past have been: music video making, forming healthy female friendships, songwriting, body positivity, authentically you, self-defense, friendship bracelet making, Dj, photography, DIY touring, zine making and more. Workshop Leaders hold the same responsibilities as the general counselors, with the addition of teaching a specific skill during the day. Those who wish to be counselors and have a passion for one of our activities offered are well-suited to be activity counselors. Director of Gear: Our Director of Gear should feel comfortable with all our gear. They will be in charge of gear workshops for campers and staff, check in and out system for all gear and caring for and fixing gear. They should feel comfortable using soldering iron and fixing multiple instruments. They should also be highly organized as they will be tracking all equipment during the summer months. Director of Mail: Director of Mail is a sleep away camp position only. The director of mail is responsible for passing out all mail for campers during the week. Medical Staff is predominantly comprised of registered nurses who work and reside in our Health Center. They handle first aid incidents, care for sick campers, and distribute medications as needed. They maintain overall health and wellness at Amplify, which we take very seriously! Director of Transportation: The Director of Transportation correlates all travel for traveling staff and sleep away campers. They work alongside the executive director and summer camp director. General Counselor: Act as the overall camper counselor. Depending on the age of their dorm assignments, they typically co-counsel with 1-2 other counselors. A general counselor’s main duty is to care for these campers, oversee their well-being and happiness, foster friendships between campers and ensure campers are minding their schedules. They are role models and dependable friends who are always there for the campers. They are encouraging and supportive and create a sense of community on campus and in the residence halls. Photography Teacher: Photography Teachers need to have previous experience teaching, ideally with youth. It is ideal if you have written a class curriculum before, however we can provide you with that if you have not. Photography Teachers should feel comfortable with a class size of between 7- 14 campers. Photography Teachers will have an assistant if more than 8 campers are enrolled. Photo Teachers hold the same responsibilities as the general counselors, with the addition of teaching a specific skill during the day. Those who wish to be counselors and have a passion for one of our activities offered are well-suited to be activity counselors. Coding Teacher: Coding Teachers need to have previous experience teaching, ideally with youth. It is ideal if you have written a class curriculum before, however we can provide you with that if you have not. Coding Teachers should feel comfortable with a class size of between 7- 14 campers. Coding Teachers will have an assistant if more than 8 campers are enrolled. Cody Teachers hold the same responsibilities as the general counselors, with the addition of teaching a specific skill during the day. Those who wish to be counselors and have a passion for one of our activities offered are well-suited to be activity counselors. Music Production Teacher: Music Production Teachers need to have previous experience teaching, ideally with youth. It is ideal if you have written a class curriculum before, however we can provide you with that if you have not. Music Production Teachers should feel comfortable with a class size of between 3- 10 campers. 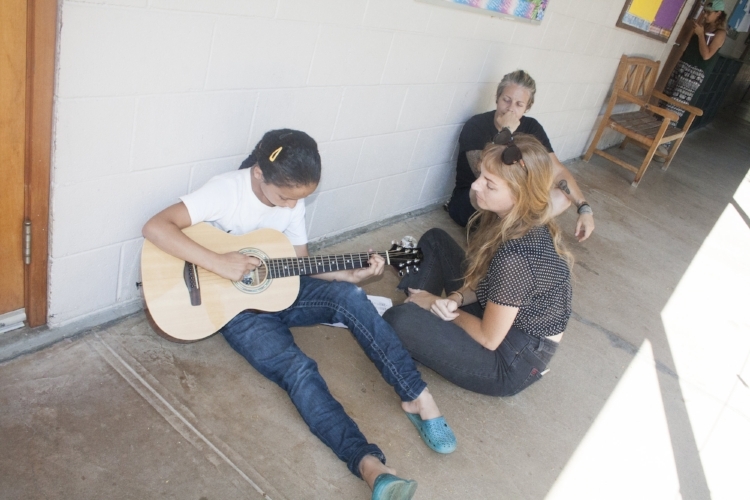 Music Production Teachers will have an assistant if more than 4 campers are enrolled. Gear Breakdown: Mac Book Pros and iMacs, Focusrite Scarelett ii interface, Abelton Push, Abelton Suites, Abelton Live, ProTools, Logic, SM58 mics, mic stands, pop filters, Midi keys boards, Machine by Native Instruments, external hard drive. Production teachers hold the same responsibilities as the general counselors, with the addition of teaching a specific skill during the day. Those who wish to be counselors and have a passion for one of our activities offered are well-suited to be activity counselors. Journalism Teacher: Journalism Teachers need to have previous experience teaching, ideally with youth. It is ideal if you have written a class curriculum before, however we can provide you with that if you have not. Journalism Teachers should feel comfortable with a class size of between 3-10 campers. Gear Breakdown: 4 Google Chrome notebooks. Writing teachers hold the same responsibilities as the general counselors, with the addition of teaching a specific skill during the day. Those who wish to be counselors and have a passion for one of our activities offered are well-suited to be activity counselors. DJ Teacher: DJ Teachers need to have previous experience teaching, ideally with youth. It is ideal if you have written a class curriculum before, however we can provide you with that if you have not. DJ Teachers should feel comfortable with a class size of between 3- 10 campers. DJ Teachers will have an assistant if more than 4 campers are enrolled. Gear Breakdown: Mac Book Pros and iMacs, Machine by Native Instruments, Traktor L4 by Native Instruments. DJ teachers hold the same responsibilities as the general counselors, with the addition of teaching a specific skill during the day. Those who wish to be counselors and have a passion for one of our activities offered are well-suited to be activity counselors. Store Leader: The Store Leader is a sleep away camp position only. This refers to a position working our camp store. More details will be given about this position at orientations. Director of Social Media: The Director of Social Media is responsible for documenting camp via our social platforms. They work closely with the Director of Photography. Director of Photography: High-paced and demanding position. Required to capture over a thousand of images and footages per day, while editing and posting throughout the summer. Preferred professional background in the field, or currently enrolled towards a degree in Photography, Videography, Communications, Media, Film, or a related study. Director of Sound: The Director of Sound runs all lunch time band performances. They should feel comfortble running a sound board and getting a good mix. Could I teach a workshop? Yes! If you have a cool workshop idea, please submit a Summer workshop proposal at the link below! If you need materials GRSB will provide them upon approval. TO SUBMIT A WORKSHOP PROPOSAL CLICK HERE! Interested in working at GRSB ? Girls Rock SB is a registered non-profit organization. Tax ID: 46-0687975.